Mounting of GPS in Bárðarbunga 2014. The eruption in Holuhraun in central Iceland in 2014 - 2015 was the largest seen in Iceland since the massive Laki eruption in 1783. The ice-filled caldera of Bárðarbunga central volcano collapsed during the eruption as 1.9 km³ of magma flowed laterally from a magma reservoir under the volcano. 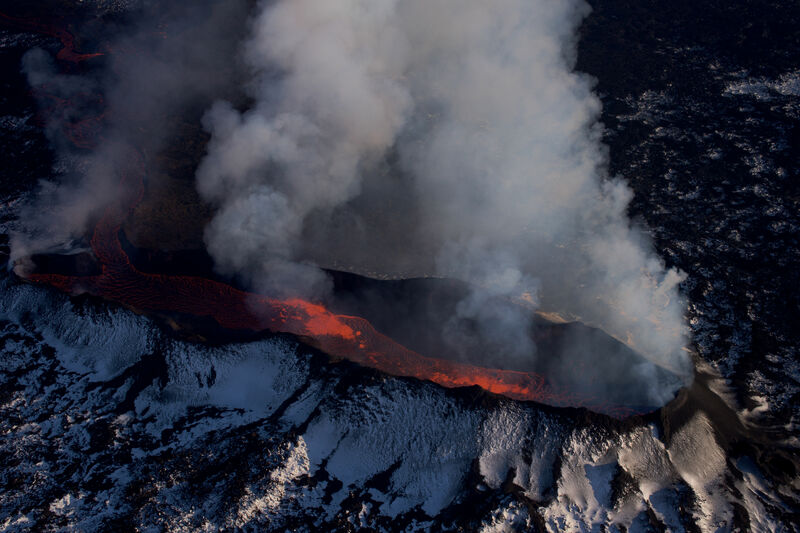 About one quarter formed a 48 km long dyke (0.5 km³) while about three quarters were erupted in Holuhraun (1.4 km³) over the six months between 31 August 2014 and 27 February 2015. The subsidence bowl formed in Bárðarbunga was up to 65 m deep and the area where subsidence exceeded 1 m was 110 km². The large scale subsidence of calderas is considered to accompany most very large eruptions as the roof overlying a reservoir of magma in the crust under the volcano collapses and falls into it. Eruptions of this type are not common. Before Bárðarbunga, worldwide only six cases are known since the beginning of the 20th century. Moreover, the caldera collapse of Bárðarbunga is the first where it has been possible to carry out detailed observations of the collapse and associated activity. Unique data could therefore be obtained that throw new light on the mechanism of caldera collapses and their interaction with the associated eruptions. A large team of scientists has now analyzed the data from Bárðarbunga and published the results in the journal Science; Gradual Caldera Collapse at Bárðarbunga Volcano, Iceland, Regulated by Lateral Magma Outflow. The group applied a variety of techniques to measure various aspects of this six-month-long event. Measurements from aircraft and satellites mapped the subsidence of the caldera, the changes in the bedrock under the ice were mapped with radio-echo soundings, and in order to analyze the response of the ice to the subsidence, 3-D ice flow modelling was used. Studies of the seismic activity in the caldera and along the subterranean path of the magma were important in revealing what was going on underneath the surface while geochemical analyses of the lava and volcanic gases together with GPS data determined the depth of the magma reservoir. Models of the mechanics of the collapse were used to gain further insight. The outcome is a more detailed picture of caldera collapse than previously possible. The results show that the Holuhraun lava originated from a magma reservoir at about 12 km depth under Bárðarbunga. The events started with onset of intense seismicity on the 16th of August 2014, as the magma broke out of the reservoir. The magma soon started to propagate towards northeast forming a dyke in the uppermost 6 - 10 km of the crust. The dyke formation is described in various publications (see end of page). This sparked the beginning of a major rifting event, eventually affecting about 50 km of the plate boundary in central Iceland, where an opening of about 2 m occurred. The caldera collapse began on 20th - 23rd of August, when the pressure in the magma reservoir had fallen substantially. This fall in magma reservoir pressure is considered to have triggered the caldera collapse. The continuation and rate of collapse was controlled by flow path properties and the load of the caldera floor overlying the magma reservoir. As the collapse progressed the height of centre of the caldera declined. As a result, the pressure difference between the underlying magma reservoir and the eruptive site declined, leading to a gradual reduction in lava effusion rate in Holuhraun. Eventually the flow became too slow, the flow path got clogged up and the eruption stopped. The collapse occurred along a ring-fault that dipped slightly outwards on the north side but may have dipped slightly inwards on the south side. A remarkable sequence of earthquakes accompanied the collapse. The course of events at Bárðarbunga and Holuhraun shows how lateral flow of magma for tens of kilometres can be sustained for months and controlled by a collapsing caldera. A comparison with the six other known caldera collapses of the last ~100 years, including the largest eruption of the 20th century, that of Katmai/Novarupta in 1912, shows that lateral flow occurred between magma reservoir and eruption site during all but one of these cases. The Bárðarbunga events also throw new light on some of the largest known eruptions in Iceland, which may have formed in major rifting events and caldera collapse as at Bárðarbunga in 2014 - 2015. The group of authors comes from 14 Universities and research institutions in nine countries. An important feature of this article in Science is the interdisciplinary approach. Different sub-disciplines of earth sciences are brought together to solve complicated problems. This interdisciplinary team was formed within the FutureVolc project during its 3.5 years of operation (2012 - 2016). The various field observation techniques and instruments used were also to a considerable degree made possible by FutureVolc. Articles on the Bárðarbunga dyke formation in Science Direct, Geophysical Research Letters and Nature.